Turkish contributions to geography are vast in content and have a very significant place in the history of geography. Turkish geographers, especially cartographers made major contributions and formed a bridge between medieval Islamic and modern cartography. In this article, original Turkish contributions to geography are reviewed. This article was first published in the Turkish review Erdem, vol IX, 26 (Ankara 2002) pp. 483-489. We are grateful to Imran Baba, editor of Erdem, for allowing publication. Islam gave a new civilization to the Turks who became great admirers of the sciences. The last words of Osman Bey (1299-1326) to his son Orhan (1326-1359) -"Be the supporter of the Faith and the Protector of the sciences"- were religiously observed. The Turks were also faithful to those nations who had contributed to various fields of science and like the Arabs ; they had distinguished themselves in the science of geography. They have a definite place in the history of this branch of knowledge and their achievements are vast. Their effects are also far-reaching but their contributions are not as well known to scholars, as they should be. Geography is that science which deals with the area differentiation of the earth's surface, as shown in the character, arrangement, and interrelations all over the world of such elements as climate, elevations, soil vegetation, population, land use, industries, national and political entities, and of the unit areas formed by the complex of these individual elements . Turkish interest in geographical matters was no doubt partly due to the environment in which the Turks were brought up. They were bound to have knowledge of the fixed stars, the movements of the planets along with the other heavenly bodies and the changes of weather for the purposes of travel over the vast expanses of the mountains, plateaus and deserts, whether for purposes of wars or peaceful migrations. They had to move, from time to time in search of fresh and better pastures for their precious flocks and herds. It was also necessary for them to acquire knowledge of plants and wild animals. Under these circumstances, the science of geography became a subject of interest among the Turks at an early stage. The institution of the holy pilgrimage (Hajj), the orientation of the mosques towards Mecca and the need for ascertaining the direction of the Ka'bah at the time of prayers also gave a religious impetus to the Muslim Turks for the study of geography. Wars and invasions, the political and administrative requirements of the expanding Turkish world as well as migrations from one place to another also helped to create further interest in the science of geography which received a further impetus. The Uygur Turks of Central Asia who were advanced and enjoyed a very high level of culture and civilization had shown a great interest in geographical matters even during the ancient period. It is said that one Uygur Turkish work deals with the movements of the stars in relations to the sun  and another work describes the revolutions of the stars . But one of the earliest Turkish geographers is Mahmud Kashgharli. He is a well-known lexicographer but drew a world map on based on linguistics. Giving prominence to the Turkish-speaking regions, he placed Kashghar at the centre of the world with other regions receding to the periphery . 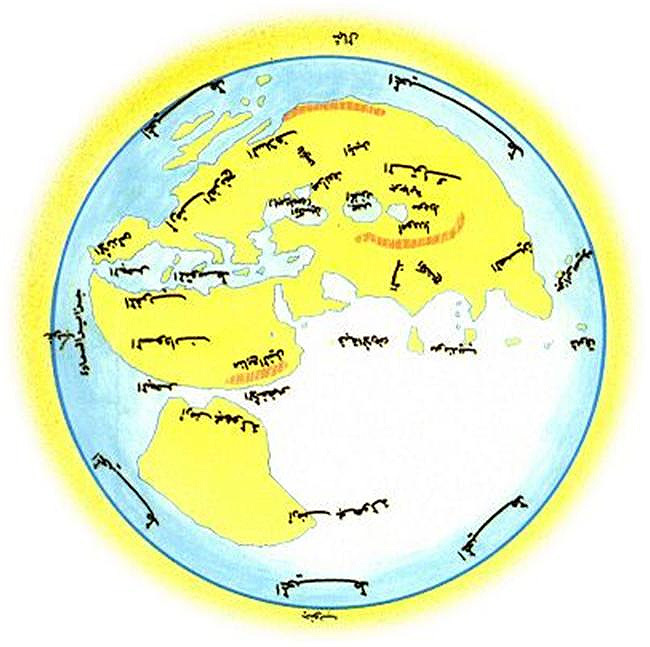 This unusual, circular world map , was drawn by him for his masterpiece entitled Divanu Lugat-it-Turk. This book is a remarkable dictionary of the Turkish language that not only gives an extensive Turkish vocabulary from the eleventh century but illustrates the usage of words with quotations from many pieces of Turkish literature. All the meanings of the Turkish words are given in Arabic: but the arrangement of the words is in such a peculiar order that finding any particular word is difficult for anyone not thoroughly familiar with the entire contents. His work, completed in 1073 C.E., is important not only from the point of view of the history of Turkish language and literature, but from the point of view of the history of Turkish culture as well. His beautifully coloured map of the world is reproduced by Besim Atalay in the second volume of the modern Turkish translation of this dictionary . The Turkish settlements, and their neighbouring countries and peoples are all prominently shown. A considerable portion of Central Asia as well as China and North Africa are also included but little beyond the Volga in the west. This is perhaps because it was drawn before the Turks began their move to the west. This work also covers geographical descriptions of various places such as cities, mountains and rivers. The geographical literature produced in the Turkish language by West Asian Turks began with works on cosmography in the style of Books of Marvels which describe the wonders of creation. Famous among this type of Turkish works are the Durr-i Meknun and Aja'ibul-Makhluqat of Yazijioghlu Ahmadi Bijan (d. 1456) who was the brother of Yazijoghlu Mehmed (d. 1453) the well-known Ottoman poet of the early period . The latter work is merely an abridged translation of Qazwînî's famous Arabic work of the same name in which more emphasis is given to wonders than scientific knowledge. The Aja'ibul-Makhluqat of Qazwînî was translated several times into Turkish  along with the other books on cosmography like Kharidat al-Aja'ib of Ibn al-Vardi (d. 1457). This type of literature was well-liked by the Turks and some translators of works like Ali bin Abd al-Rahman and others have added new materials to their translations. The extracts of Taqwim alBuldan of Abu'l-Fida was also rendered into Turkish by Sipahizâde Mehmed bin Ali (d. 1588) who also produced a new Arabic edition of the same book with the materials arranged in alphabetical order along with his own additions. He is also the translator of Qanun al-Masudi and other works in Arabic. Mehmed bin Omer bin Bayezid bin Ashiq (b. 1555) is also a famous translator of the earliest geographical works. His Menâzir al-Awâlim which was completed in 1598 consists of two parts. The first part deals with the 'world above', that is, heaven and the celestial bodies, and the second part describes the 'world below', that is, the earth and its inhabitants. The book contains geographical materials on oceans, islands, lakes, rivers, springs, mountains, and cities, which are basically translations of the medieval Arabic geographical works of Ibn Khurrdazbheh, Ibn al-Javzi Yagut, Qazwînî, Hamdulah Mustawfi and Ibn al-Yazdi but with supplements of the translator's knowledge on Anatolia, Rumelia, and Hungary. Minerals, plants, and animals, are also discussed in this book. The most prominent Turkish geographer is Muhiddin Pîrî Reîs (d. 962 A.H./1554 C.E.) who also produced original works in the fields of marine geography and navigation. He was nephew of the famous naval hero, Admiral Kemal Reîs, himself a Turkish admiral. He knew every corner of the Mediterranean Sea and was the commander of the Turkish fleet blockading the harbour of Alexandria at the time of the invasion of Egypt by Ottoman Yavuz Sultan Selim. Figure 2. The world map by Mahmud Al-Kashgarî, 1072. Published in B. Atalay, Dîvânü Lugat-it-Turk Tercumesi, Ankara 1940. He was also interested in the science of cartography and had completed a map of the world in 1513 C.E. This world map was drawn in two parts on a gazelle hide, but only the western part is preserved in the Topkapi Museum of Istanbul. This portion, which is 90x65 centimetres in size, depicts the eastern regions of America and the western parts of Africa, Portugal, Spain and the Atlantic Ocean. It includes various coloured pictures, numerous illustrations and relevant notes on the countries, their peoples, animals and plants. 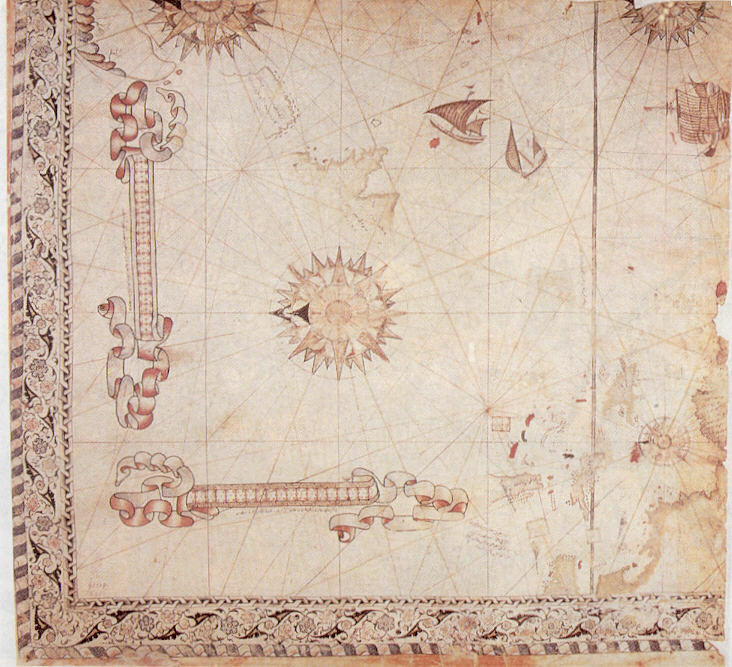 This map which is a portolano , has a mathematical basis and Pîrî Reîs used some twenty maps in constructing it, eight of which were new maps of Mappa Mundi , four were drawn by Portuguese explorers, there was an Indian one in Arabic and one which was the lost map of Christopher Columbus  recording the discoveries made by him during his three voyages. Like other contemporary maps, it has no lines of longitude or latitude. Nevertheless, we can see two rose-compasses, one in the north and the other in the south. Each of the roses in divided into 32 parts and the division lines are extended beyond the rose frames. Each wind rose is equal to one sea mile, as is shown in the measurements on the area near the wind roses . He drew the mountains in outlines and the rivers are marked with thick lines. The rocky regions are indicated with black, the sandy and shallow water with reddish dots, and the rocky parts in the sea that cannot be seen by sailors with crosses. This is, in the words of Professor Dr Afet Inan, one of the oldest and yet a perfect map of America, drawn by a Turkish admiral . Pîrî Reîs also drew a second world map in 1528 C.E. of which only the portion depicting the western hemisphere is preserved in Topkapi Palace Museum of Istanbul. Its size is 68x69 square centimetres. It is in colour and has ornamental figures on the margins of the map with explanatory notes. The preserved portion shows the northern part of the Atlantic Ocean and the newly discovered regions of North and Central America. It has four wind roses and the Tropic of Cancer is also shown which was not in his first map of the world. The scales used in the second map are bigger than the first. The drawing of the coastlines shows great improvement in technique and also bears close resemblance to the modern conception of these areas. The stony and rocky sections are given especial care. Dr Sevim Tekeli has pointed out that a comparison of the two maps shows that Pîrî Reîs had followed the new discoveries very closely . In his second map Pîrî Reîs had shown only the parts of the world that have been already discovered and had left the unexplored area blank saying that they were as yet unknown. It is also said that he drew maps of the Indian Ocean and the China Sea but none of these seem to have survived. The book of Pîrî Reîs on marine geography is entitled Kitab-i Bahriya. This contains 209 chapters with 215 maps, charts and pictures to give exact account of the coasts and islands of the Mediterranean and the Black Sea along with a description of the seas. It is said that his models were Italian portolano charts and other navigational handbooks whose major parts have disappeared. Basically the book is a kind of guide to navigation and is based on his personal observations. He gathered all previous information on the subject but added to it other practical knowledge necessary for sailors on the most important coastal routes, and drew large maps for every chapter. In this way the book became not only a mere guide book, but also the greatest contemporary portolano with the most advanced cartography techniques. His Kitâb-i Bahriya was first dedicated to the Ottoman Sultan Selim I in 1521 C.E. but after his death, Pîrî Reîs prepared a second version with many additional maps, a modified and revised text and a poetical preface of 1200 new verses in the Turkish language on the lore of the sea and the sailor which he presented in 1525 C.E. to the Ottoman Sultan Suleyman. His own ideas about cartography are recorded in his preface of the book in which he says that a map is a skin on which the shape of the sea and the winds are drawn and making maps requires profound knowledge and specialisation and the slightest error in drawing a map makes the map useless. He also said that he had made use of all the known maps including those covering the Chinese seas and the Indian Ocean that were unknown in the Western World at that time. Pîrî Reîs was one of the most outstanding scholars of his time. Besides his native tongue, he knew Greek, Italian, Spanish and even Portuguese and he acknowledged his debt to various works in these languages in drawing his maps of the world . 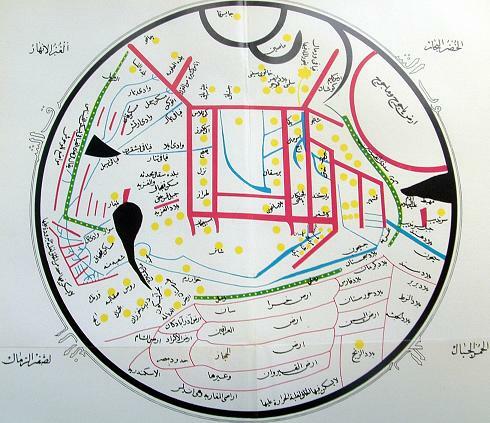 Experts are of the opinion that the maps drawn by Pîrî Reîs were superior to those made in Europe at the time, in both content and technique . Another important book on marine geography and navigation entitled Kitab al-Muhit fil-'ilm al-Aflak va'l-Abhar was written by Sîdî Ali Reîs who is commonly called Kâtib-i Rûmî (d. 1562 CE) completed in 1554 CE it is based on the personal experiences of the author as well as of other Arabian sailors. It is like a guide book which deals with the Indian Ocean and the African coasts. His other book on geography, Mirat al-Mamâlik covering India, Afghanistan, Central Asia and Persia is based on his travels, adventures and personal observations. The book is a description of his journey to India and, after the unsuccessful Ottoman naval expedition against the Portuguese in the Indian Ocean, his return to the Ottoman Sultan's court in Edirne. His Mirat-i Kâinât is also an important book. It is said that Kâtib-i Rûmî drew several maps for his books but the surviving texts are without maps. Yet another Turkish work on marine geography is Kitab Bahr al-Aswad va'l-Abyad (Book of the Black and White Seas) written by Sayyid Nuh. The most important and comprehensive geographical work produced by the Turks is the Jihâm-Numâ of Mustafa ibn Abdallah, better known as Kâtib Chelebi and Hajji Khalifa (1017/1608 - 1067 A.H./I656 CE). He is famous for his great encyclopaedic Kashf al-Zunun which is a history of Ottoman literature written in Arabic which has preserved long excerpts from works which have not otherwise survived. His biographical encyclopaedia of famous people entitled Sullam al-Vusul and his history of the Ottoman Turkish navy entitled Tuhfat al-Kibar fî Asfar al-Bihar are still used as reference books and sources. He was one of the most learned and accomplished writers as well as being a famous scholar. Besides being master of the languages of Persia and Arabia, he was well skilled in French, Italian and Latin; and he translated several works from these languages. He is also the author of several other excellent geographical works but his Jihan-Numa is the most remarkable book. It contains very valuable information on the geography of Anatolia, Syria, Iraq, Egypt and European Turkey. It is said that he began it twice and twice it remained uncompleted. His first version of Jihan-Numa consists of maps finely drawn by the author on the margins of the book, devoting one map to each sanjak or vilayet The second version of Jihan-Numa was printed in 1145 A.H./1732 CE by Ibrahim Muteferrika (1674-1744 CE) who established the first printing press in Istanbul in 1140 A.H./1728 CE This book was the eleventh product of his press and contains a full-page map which constitutes the transition from the medieval oriental to the modern European point of view. It is also said that these maps are in the style of contemporary European cartography but with inverse orientation, that is, with north at the bottom. To the best of my knowledge, he took existing Muslim and European materials and reshaped it in his own way. Many people later copied him, but all the credit must go to him as its designer and architect. He had also translated into Turkish the Atlas Minor of Gerhard Mercator which was edited by Jodocus Hondius and to which the translator gave the title Levami al-Nur fî Zulumat-i Atlas Minor. The major Turkish work in the field of travel writing with geographical facts is Tarih-i Seyyah better known as Seyahat Nâme of Evliya bin Dervish Muhammed Zilli usually called Evliya Chelebi (1611-1678 CE). This unique ten-volume work in is based on his travels to every part of the Ottoman Empire and its neighbouring countries. His travels lasted for about forty years (1631-1670 CE) but his work is more than a description of the travels. He recorded a vast quantity of observations on culture, folklore with examples of the phrases of the various languages, geography and descriptions of the remarkable buildings, beautiful cities and landscapes. Other Turkish writers have also written travel descriptions but some of the productions stimulated by annual Holy Pilgrimage (Hajj) are remarkable from the point of view of geography. Among these the Manâsik al-Hajj of Mehmed Edib (1193 A.H./1779 CE) is very detailed. Ali ibn Ahmad ibn Muhammed al-Sharqi wrote a work in Turkish in 1551 CE that contains an interesting world map which reminds us of al-Beyrûnî. Mustafa Resmî also drew a remarkable map of the Black Sea, hand painted on silk in 1785 CE. But a considerable step forward was the printing of a modern atlas with extensive commentary in 1218 A. H. / 1803 CE by the newly founded State Printing Press of Istanbul under the title of Jadid Atlas Terjumesi. Turkish contributions to geography including cartography are very significant, vast, in content and have a definite place in the history of geography. It is also a fact that while the Turks were mostly influenced by the Arabs they have not followed them slavishly. Turkish geographers especially cartographers made some very significant contributions and they may be said, in the words of Professor S. Maqbul Ahmad , to have formed a bridge between medieval Islamic and modern cartography. For details see my articles on "Arab and Geography" and "Muslim Contributions to Cartography" both published in Al-Islam of Karachi, vol. 11, No: 8 (April 15, 1954), pp. 58-59 and vol. 11, No: 12 (June 15, 1954), pp. 94-96 respectively. The Random Home Dictionary of the English Language, Delhi. 1972, p. 552. Turkish Architecture, Translated by Professor Dr. Ahmet Edip Uysal, Ankara, Turkey 1965, p. 2. S. Maqbul Ahmad, Kkarita in New Encyclopaedia of Islam, vol. II, p. 1080. History of Cartography, edited by R. A. Skelion, London 1964, p. 209. It was published by Turk Dil Kurumu of Ankara in 1940. The History of Cartography of Leo Bagrew which was revised and enlarged by R. A. Skelton and was published in 1964 in London also has its plate but it is only black and white. E. W. Gibb, A History of Ottoman Poetry, vol. I, London 1958, p. 392. First translation was done by Rukn al-Din. Ahmad. Portolano is a term used for all such maps or charts showing the position of ports for navigation and is based on the idea of the earth being flat. He was an Italian navigator in Spanish service and the discoverer of America in 1492. He died in 1506. Afet Inan, The Oldest Map of America, Ankara 1954, p. 27. Dictionary of Scientific Biography, New York 1974, X, pp. 616-9. 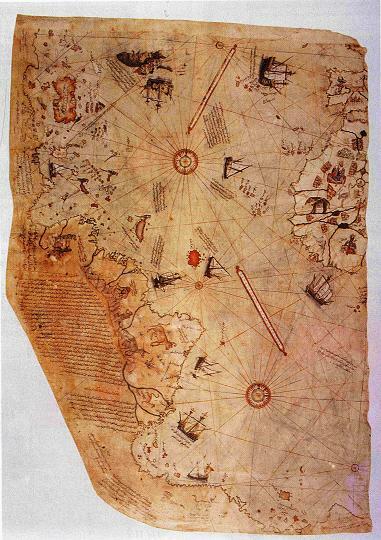 Afet Inan, The Oldest Map of America, p. 15. Turkish Architecture, Translated by Ahmet Edip Uysal, p. 20. New Encyclopedia of Islam, vol. IV, p. 1082. * Prof. N. Akmal Ayyubi is at Sofia Kuteer, Dodhpur; Aligarh, India.